Opinion: IGP Kayihura need help and that quickly! This is not something I wish to say, but somebody has too. The man, the Commander, the loyalist to the NRM-Regime and Mzee, IGP Edward Kale Kayihura needs help. I don’t know what kind of help, but something to make sure his spin-control or Consultant Company to make sure his resume gets respected. He has always blamed the opposition not to following laws or following the Electoral Roadmap, even when it is the police who are besieging the events. They have been stopping meetings, detaining fellow citizens for walking by opposition meetings. Crashing streets with tear-gas and brutally stop the meeting between the opposition and the people. Then he claimed back in the day that the media we’re to embedded with opposition figures and their convoys instead of covering politics and policing fairly, but he didn’t question the police when they destroyed cars, detained people without charges or even undressed political activist; that was all okay! So this one day in July he confessed that he wasn’t ready for the Dr. Kizza Besigye release on bail, as he has been detained and jailed for all kind of reason; he is surely still monitored and followed by his men. They are obsessed with the man and his stature as they had to while he was driving towards FDC headquarters in Najjankumbi, the Police Officers we’re driving behind and caning by-passers on the road cheering Besigye’s arrival. Still, the Commander so obsessed with following Mzee, is now spinning the issue towards Besigye and saying he is working against him. That is partly true, as he wants to change and wants a democratic Police Force, as well as accountability and transparent government. Instead you are accepting the NRM cronyism, while you are following Mzee obediently. With that in mind even when violence is used against innocent citizens, the problem is Besigye. It is always Besigye, not the system and Police Force working to silence opponents of Mzee. No, that cannot be the case or the matter; especially for a loyal Commander Kayihura. Kayihura needs help, really needs help; he just doesn’t know that himself yet. Because he is stuck behind a hard place and a rock; neither is going to be peaceful or just. They just are going to be hard and narrow. The Commander does not understand what harm he does to himself and his family, because he is lost in the tangle-web of Mzee and needs his grace. Therefore the Commander blames everybody else for the issues of his Police Force and misuse the draconian laws, instead of securing the public and citizens. He is instead a force for oppression against the public and silencing them. The worst it seem, the Commander think he have the ability to legitimize his actions towards the. That is why he needs help because brutality isn’t Besigye’s fault; he is passing by and driving!! He is not caning and using tear-gas against civilians. That is the Police Force doing under the Command of Kayihura. That is why he needs help and understand his twisted fortune, twisted fortune that is stuck behind loyalty to oppressive behaviour and self-belief in justifying violence against civilians. I know it isn’t easy to him understand, but if somebody hurt his family often, detained his cousins without charges and destroyed his office as a crime-scene. Then he might understand the oblivion of unlawfulness he has created per instruction of the NRM-Regime. If he would though, as nobody would like to give him the same treatment in a just society; he would be court-side answering for the all the men and woman without charges lingering in jail and all the safe-houses not answered for. This are your legacy together with oppression of opposition with brutal force; not good policing and detecting conspiracy to solve serious crimes. As a commander Edward Kale Kayihura will always be connected with POMA and the destruction of fair political landscape as the Police Force does more to detain opposition than stopping ordinary criminals. 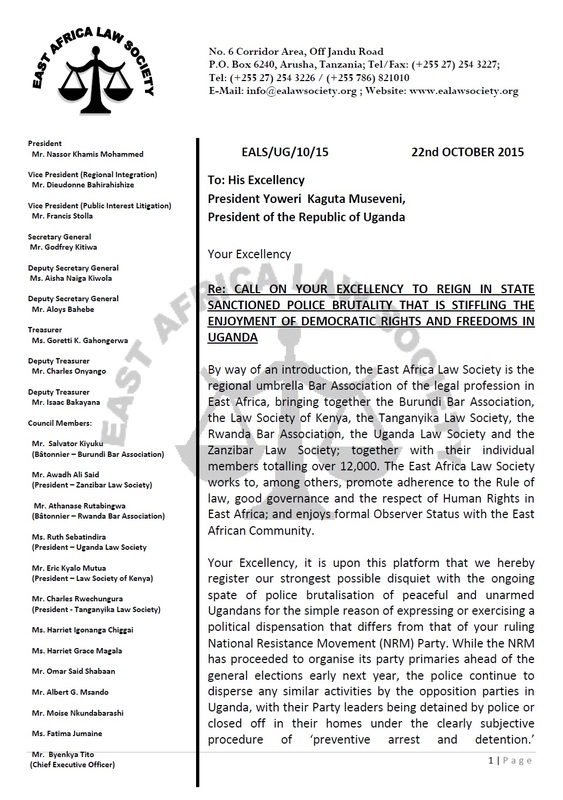 The UPF could be respected, but since the Kifeesi squads and their violence is going against the public on your watch. That is what is done on your duty Commander! So you need help so-called honourable Commander Kayihura, because your ways are apparently twisted and you’re justifying violence under the banner of defending citizens. So with that Police Brutality against innocent civilians proves that you’re not policing, but instead being a useful tool for oppression under the NRM-Regime. That is your legacy, even if you like it or not. Peace. Wasn’t it supposed to be Civilian Authority is and always above Police Authority; What happen to justice for all? It’s not my way to utter these words, but I feel I need it, not because I am right man; I am far from being the right man to address it. As I was raised in peace, lived in peace and endured peace. Still, feeling the sorrow of the lost in Juba, the extra judicial killings in Kenya, and the unarmed African American citizens killed across the United States, while an armed former Afghan Veteran kills 5 Police officers. The scores are so uneven, the justice is not prevailing and the cases are staggering. The Police brutalities in dozen countries like Kenya, Uganda, Zimbabwe and Zambia; the Police are detaining without charges, torturing and battling the citizens as they are vicious armed criminals. All of these killings, all of these Police Officers acting on behalf of oppressive states, the others are systemic inaccuracies blended with the ignorance and racial bias. The state of affairs is different in the United States, compared to the other Nations, but the systems are still brutally attack the civilians like they are cows ready for slaughter. Instead of fearing the public they are harassing it silence. The tormented and the families who lose their loved ones, the ones that are bystanders and just happen to be by a Political Rally or pass by a Demonstrations in a town; gets shot, get killed and even detained as they are vile creatures instead of a human being. The color of skin, the creed, political affiliation or faith should not be the factor if you’re waking safe down street or taking a public transport… Instead they are law-abiding citizens who even comply and do their duties to demonstrate, to act upon the fate of affairs, conduct meetings and rallies, the cost is detained at police post, taken away from their homes on conspiracy and even killed. These matters are happening to often in 2016. The leaders of these reactions to the Government, the leaders who are addressing the civil concerns of the state, are prosecuted, detained and even monitored by the Security forces of the states, as they are worse criminals then rebels or terrorists. They are addressed in speeches by the leading fractions and the MPs connected to the ruling regime as personal vermin, people who fronts sectarian violence and creates the problem. Even if the state security forces are the ones that makes issues in peaceful affairs and puts gasoline on the fire. Not that all demonstrators are peaceful or correct, but that does not give the Police rights to shot live bullet, water-canons and tear-gas at any given movement of crowds against uneven and unrighteous cause. The killings, the brutality, the sincere atrocities, the blatant ignorance, the little fear of the ruling regime, the masters of violence, the killers and Police Officers are guarded by the ruling regimes. As they are co-conspirators with the ones that systemically control the state ordered violence and want to shut down the spirit of any organized demonstrations, movements that are positive for democratic change or even just question the legitimacy of the ruling regime. This does not comes to mind in the United States, there it is more racial biased approached as the human and gun-laws are yet again proof of misguided regulations as the loss of life in small-fire arms shootings are staggering. Still, the Senate and Congress are not able to sustain and make amendments that can stop the guns from coming to hands of people who have a unsteady mind and unsound health condition to pull the trigger at innocent citizens. While the Police Officers are nearly hunting on the innocent and creating an atmosphere, where your guilty until proven innocent, which is not any ideal approach. We can all wonder when this power-struggles, when the bullets, when the tear-gas, when the water-canons and when the ignorant violence, when the killings will stop and to what extent does it has to happen, before the hash-tags, before the blazing guns and blistering barnacles! There are just to many lives, to many hurt and to many questions, to many unsolved mysterious, too much blood and to many tears. There are something sinister and something uncertain as the attempt to sustain power by any means, the profits, the structure of society, the fabric of our existence, the approach the viciousness and vile attempt of resigning to the fact the only way we can solve the fear of each is with guns and ammunition. There must be other ways of dialogue than with John Wayne, Al Capone and Giles de Rais. There are too many men and woman who have lost their life, too many who have been taken away from their loved ones and too many to mention. While the laymen are prosecuted and the civilians are too, the men in charge are walking away, the men and woman who protect the manufactures, the military, the Police Commanders and the Executives are just free-men and can do as they please, as the violence, the killings are reappearing as the sun is setting and making sure it has the energy for another day. The men and woman who are in charge, the men and woman are taken away; we’re supposed to be living in the same society, under the same laws and under the same regulations; where justice and freedom should prevail, where men and woman are equal, where there isn’t fear and isn’t unbalanced treatment between State Security Organizations and the Civilians. As long as there are unbalance, as long as there are inaccurate procedure and executives are not handling it peacefully, if they are giving way to impunity and injustice, their rule will be remembered for the justifications of these vile attempts of self-justice, these atrocities under their leadership and reason for the loss of these lives. The deaths, the murders and senseless killings proves the arrogance of leadership, the certainty that guns can create power, that the guns can solve matters and prove justified to settle either political framework or even power-struggle, the fear and amassed causes the personal bias, the blatant accurate shootings and killings are vicious. The men and woman deserves more than becoming a hash-tag. The terrorist killings in Turkey, Paris, Brussels, Beni, San Bernadino and all the others, deserves more than the hot-minute of fame, change of status on Facebook and blended Profile Picture, they deserve more credit and remembrances, as all the souls of the lost got vanished by brutal force in matters of hours. The continued civil, political and armed unrest in Libya, Syria and Yemen, the skirmished between Eritrea and Ethiopia; proves the hostile environment other places, the Somalian forces are both fighting in their own territory, but also going against their oppressors on their domain to retaliate. While the Burundian are detaining school-kids for painting slurs on the President Nkurunziza’s pictures and killing opposition, being violent and answering the men and woman who demonstrated against the 3rd Term President of the Burundian Government. President Magufuli have detained a man for writing hostile words on WhatsApp and charged and detained MP for calling him a ‘dictator’, as the President proves that he is similar to his counterparts in the rest of the East Africa. This is not vile crimes, but proves how far the government uses their security forces to control their citizens and their will to speak. I am sure in one of these countries, they would detain me in second, to silence my train of thoughts. The 2016, have been and is bloody, as the boats of immigrants from the civil wars are drowning in the Mediterranean sea as they cross in tiny boats by smugglers to safety in Greece or Italy; as the safe heaven are supposed to get them safe from the spoils of war and power struggle between government forces, militias and armed opposition forces, as the death-toll and weak government structure that we’re centralized under one big-man is fractioned and dwindling away as the Civil Society Organizations, International Organizations and Multi-National Dialogue and stakeholders doesn’t have the capacity or the will to take charge of the unrest and uncertainty. We have to question; will our government deal with the matter at hand? Will the government who are in charge take approaches for dialogue, for talks and creating a space where the safety and the justice have a place in the society, where the force of the state is not killing and not abundantly forcing themselves with violence on the civilians. The system of oppressive behavior and the crisis of leadership as the problems in the states, the dissolved the assertiveness of people, as the men and woman are torn, the parties are polarized and the peace has crashed; the tensions between the sovereign power and the self-righteous state officials that aggravate the public, it is not right for the leaders to use their internal squabble for power create havoc that birth more violence between two parties. That is not in the parties that one part is the state, the other is peaceful protesters, which is a different scenario, than when both are armed and kill each other to secure power and rule indefinably. Is this what we want to remember 2016 for the civil unrest, the civil wars, the civil casualties after the violence and state organized shut-down of the public disobedience…? The disobedience and the demonstrations should be able to happen without any reactions that create a problem for the state or the state goes in a turn it into a battleground. There are so many questions, so much we miss and so many political and structures that needs to be reformed, so many leaders who need a bit of humility, the humility of Police Officers, the humility of the Executives and the leadership of the States. It’s complicated, it’s all very HiiiPower. We have to ask and we cannot let this go, we cannot let these men and woman just die for so little, as a hashtag and a little social media drops. There are just too, we have to question the powers to be and what they are doing to stop this. We cannot be silent, accept it and let it go. This is just too much. I know I am not the right man, I am the wrong man, but I had to say my peace, I just couldn’t let this one be. Hope you start to think, question and wonder why we let them get away with it. Peace. Today there we’re planned marches from the Opposition in Lubumbashi, Kisangani, Bukavo, Goma and Kinshasa after what I perceived information and the reports today are startling. As there were planned demonstrations in the capital Kinshasa, there was calm in the morning, but there we’re many closed stores and police we’re in the streets. Also less traffic than normal as well. The youth of the UDPS with its head David Mukeba was the first line to the front of the demonstrations at one point, so UPDS Youth was not following party-line and participating in the demonstrations. At one point the Police barricaded the Martyr’s Stadium. At the MLC Headquarters the Police threw tear-gas at the demonstrators there. This was even said on the Police action: As they walked on the proposed route, the protesters still had to retreat. “Even on the route imposed yesterday, they charge” (…)“We respected the line established by agreement Tuesday”. This proves that the agreements made the ones behind the Demonstrations and the Authorities, the Big-Men change their mind and then the Police starting to use fear and intimidation against the people on the streets of Kinshasa. What is shocking: “that Congresswoman Maman Eve Bazaiba Masudi has just been shot in the leg”. She wa apart of the Demonstration in Kinshasa today! “Police talks about 2,000 demonstrators in Kinshasa. 35 police injured in the capital. The spokesman said no trace respected.Police said an accident caused the death of a civilian. Also there we’re 6 serious injuries, but No Police officer shot”. “They promised a peaceful protest and we found ourselves facing the rioters ,” said the police spokesman. The planned demonstrations in Lubumbashi did not happen as the people we’re scared as the Police was already in the streets, and the demonstrators was not organized as their leadership was disorganized by the authorities. In Kisangani the town was totally silent after the Police and Authorities didn’t allow the Opposition to demonstrate in town. There been reported that their been arrest in town, but no accurate number. While in Bukavo there we’re demonstration that the Police tried to disperse as several of demonstrators are arrested and even some are hurt by the Police brutality in town. There we’re demonstrations in Goma, and there the Police brutality went even further where even pictures of demonstrators killed by the Police. There been reported arrest from the Police in town, I don’t have any number. This is also reported from there: “minor children have been detained by police for participating in demonstrations, as the children showed tears when they boarded the Police pick-up”. There was also reported that as the Police shot towards the demonstrators with live-bullets they even hit and wounded a Six-Year old girl in her leg. In Butembo in North Kivu where there also we’re demonstrations there are released pictures of a demonstrator who was killed by Security Forces during the demonstration in town. In the town while the Police dispersed the public, are truck hit a motorcycle and arrest 4 students and 1 UNC member. In Bunia there we’re demonstrations, as everywhere else, the Police Brutality we’re there and they used force to disperse the demonstrators. They got 30 minutes to march in the town before the Police starting doing their thing. What the UN Human Righs DRC is reporting: “at least 9 prohibited demonstrations, 59 people arrested, 1 person & 1 policeman killed, 4 injured” (UN, 26.05.2016). Gustave Moke reports this about today: “Dr-Congo 100.000 people march against Kabila’s third term & call 4 Pres. Elections: 2 dead, 19 arrest, 57 injured” (Moke, 26.05.2016). So today the People where it was possible and as long as they we’re allowed too, they walked asked for change in constitution and justice for the people dying in Beni; while the Authorities with their security organization did what they could to disperse, detain and even at some points even taking lives. There been showing their true face and little dignity towards the citizens and protestors. They also protest against the breach of constitution if the current President Kabila wishes to go for a third term, which is most likely; as there haven’t been since independence any peaceful change of Head of State or the President. They have been sitting in power until somebody came with enough guns to punch the clock and take the salary; then they either go into exile or the casket. Therefore the next election is important. Peace. Opinion: The Ugandan Police is so embedded into the Politics; that it’s level is questionable; as IGP Kayihura decides and ushers political work: when he should focus on crime and not on Besigye! The Ugandan Police have monitored and been a political engine for long but the recent days and months to prove to what extent. As the realization of how embedded in the ruling it is. 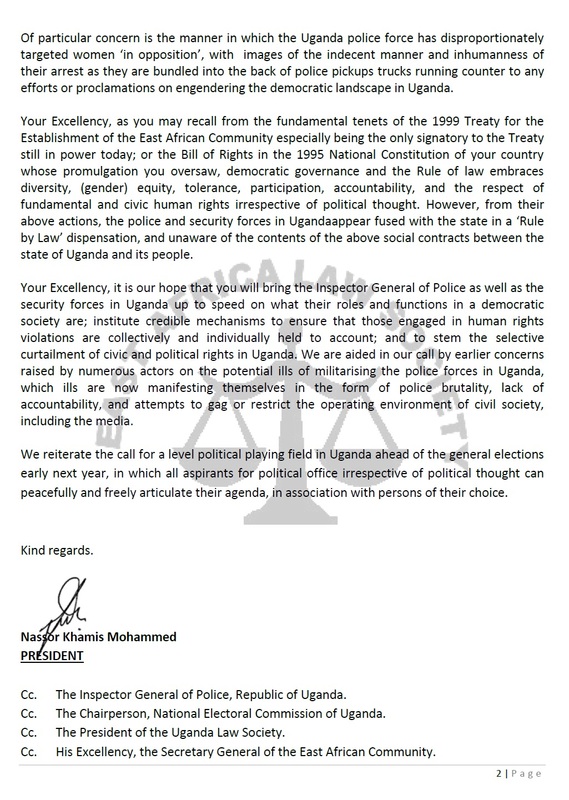 There is not only the ways the Uganda Police Force is detaining Opposition and Monitoring Opposition leaders. That with the knowledge of the Democratic Party members, Forum for Democracy leader and supporters; the way the Police uses it’s time to cause havoc around Besigye every time he kicks his shoes on the outside of the compound of Kasangati, Wakiso. We are at the point as I have realised something that is not only a Police State where the Police is embedded with the Political Framework and monitoring the Opposition. That is bad enough. It is nothing positive when you know that the Police is Preventative Arrest and dropping more charges on the Opposition leaders then there are Malaria Medicine at the Yumbe Referral Hospital. Not that says lots of the state of Yumbe Hospital, more about the state of Police who has the time to add charges on every movement from the several citizens who have a mind of not being parts of the National Resistance Movement, henceforth challenging the freedoms and liberty of these individuals deserve. Well, the Police Force have taken the liberty to involve themselves directly in the Politics. As the Inspectorate General of the Police have taken decisions that he shouldn’t have. Not in an ordinary state of affairs, as his job should take criminals not decide political issues. The IGP Kayihura have taken the decisions to crash consultations meetings and stopping the opposition from having ordinary work and assemble in districts and towns around the country. Well, that is under framework of the Public Order Management Act. That is not what made me think today. It is because as the Councillors of Kampala was sent to the Executive or President Museveni, with the cover-up of the involvement of the Police in that shin-ding. What made me think was the knowledge of the existence of a Senior Super of Police Susan Kasingye Commissioner Electoral & Political. That the Uganda Police Force need a person to commission the Electoral and Political offenses and the admission of doing political work in the country as she must have a Commission who monitors and decisions of the Political Parties as she can’t be as useless as Hon. Byandala the Minister without Portfolio. Ms. Kasingye the daughter of Kayihura must have something to do, as she must be involved in the care of collecting information and spying on the Political Parties. If Norbert Mao thinks of drinking in Gulu or Padre; If Mbabazi thinks of filling gas on the only car he has in his driveway and so on. But to have Directorate and Commission on Electoral and Political should boggle your mind and send the “Yes, Minister” squabble and crass reality as if a man throws the egg to the wall and think that it still be a whole egg. An egg is fragile and will break on the moment it hits the wall. That is something we knows as we know how weak the eggshell is before throwing it into the air. As we still remembers how the public shunned the local councillor elections and the tiny numbers as the Electoral Commission was tallying the results. In midst of this there was waiting for the final call from IGP Kayihura to verify if Makerere Division of Kampala where the results was showing that Doreen Nyanjura was the winner, but the EC didn’t verify and accept the result before Kayihura had given his thumbs-up; as there was speculated that he tried to trade the position to somebody else and the deal went through. And if it is so, then the Political system is totally infiltrated by the Police Force.